Your Bolton home needs proper insulation to protect your investment and improve comfort. If your home in Bolton home has not had its insulation updated recently, then your home is not protected to the current insulation standard of R60, based on the 2017 Ontario Building Code. 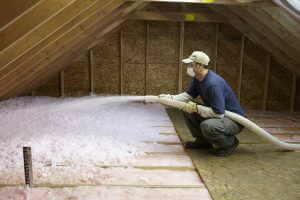 Attic insulation is an important part of a safe and healthy roof system. VK Roofing is a trusted, experienced Bolton insulation installer. We are proud to serve Bolton as a certified Owens Corning insulation installer. We use AttiCat, Canada’s #1 attic inslulation brand. We are conscientious about all aspects of our work, caring for your home just as if it were our own. Drop sheets are used in every area where our workers will be present. A weather strip seal is added to the attic hatch so there are no gaps, to improve heat retention and prevent air loss. Foam sheet insulation is attached to the attic hatch to improve insulation. Attic space is carefully prepared by removing old, damaged or ineffective baffles, installing new ones where necessary. All recessed lighting fixture backings are protected with special fire rated covers. Rulers are placed in attic spaces to ensure a consistent depth of insulation is blown into the space, to ensure consistent protection. Garbage is removed and all debris is vacuumed from your home. A final inspection makes sure that everything has been cleaned and put back where it was before we arrived. Contact owner Anthony Van Kooten for a FREE No obligation quote in Bolton for insulation.